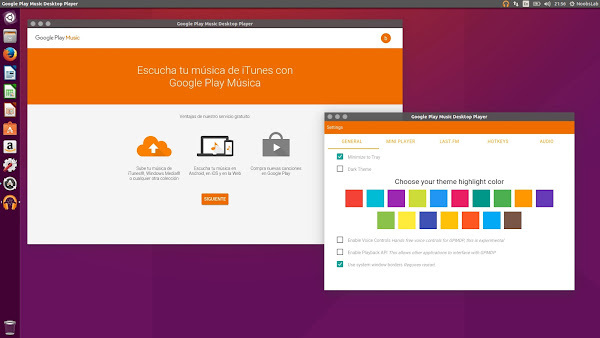 Do you use Google Play Music on your Android device? 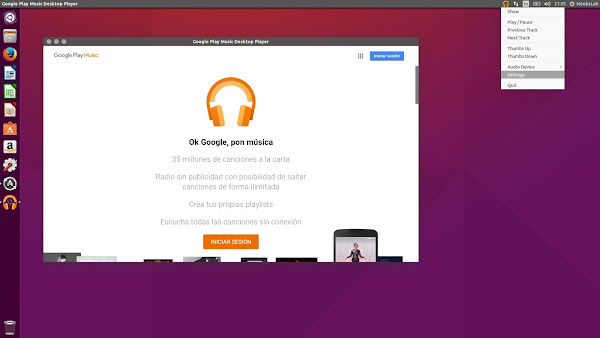 If yes, here is good news for you, Samuel Attard developed a Google Play Music desktop client and from now you don't have to touch your mobile for Google play service because you can do it right from your desktop. It is open source, lightweight, free, and cross platform available for Linux/Windows/Mac OS X. Google is known to not make applications for Linux desktop except few like Chrome, etc.. The application has since been consistently updated, and features Google's Material design, along with nice functionalities like a settings window. The player is based on HTML5 and doesn't require Flash to work, and it has Last.fm integration and there is even a clean implementation of hands-free voice controls (which is experimental). You can also switch to mini-player and make desktop experience better, also there is a panel indicator for this application which comes in handy. Another feature offers media key support that allows you to set hot-keys for specific actions and make it easy to use for yourself. Deb packages are available for Debian, Ubuntu, Linux Mint and other Debian based distributions but if you are using other distribution then download source from Github and compile it.